As another financial year ticks over, we welcome the 2018 financial year as a new opportunity to increase our wealth with a potential tax refund. In this segment we look at the various deductions available to students to increase the likelihood of receiving a tax refund. It can be considered, students have it tough. 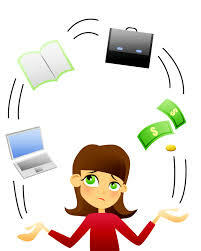 Balancing work and study can be stressful and leave little time for leisure. Course fees – Note: Only deductible when paid upfront and not within the Government HECS debt program, as that is a loan NOT an expense payment. External tuition services – Must be from a registered business. Travel between home and your place of education. Travel between your place of work and place of education. Parking costs – For example your University/TAFE has paid parking. A home Office Expense – The hours per week you study/work from home. Internet – A percentage of this used for study/work is tax deductible. Purchase of Laptops, tablets, etc – The depreciation on these devices is tax deductible. This article (written by Steve Ryan) appeared in our July 2o017 newsletter.